Yesterday I took the train from Victoria to West Dulwich to see the exhibition called ‘Art & Life’ at the Dulwich Picture Gallery. I’d never been there before and it was a lovely experience walking through the garden to the old gallery on a hot summer day. Tables from the open-sided café spilled out onto a sunny terrace by the gardens, so I stopped and I enjoyed a traditional afternoon tea. By contrast I was deeply disappointed when I walked into the gallery area assigned to the modern exhibition because of the heavy yellow lighting. I filed a complaint about it, but I’ll get to that later. 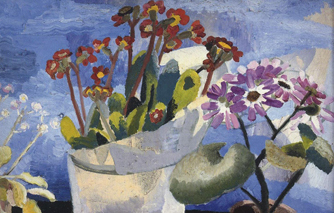 The exhibition showed paintings and pottery by artists of the ‘Modern British Movement’ from 1920 – 1931, primarily Winifred and Ben Nicholson and their friends Christopher Wood and Alfred Wallis. The overall impression (disregarding the lighting for now) was of the low key, relaxed style of that group which is more often associated with the house at Kettles Yard in Cambridge. There were still-lifes, landscapes, seascapes and portraits. Some of Ben Nicholson’s paintings verged on abstraction which he embraced later in life. He used stippled oil paint and pencil to produce paintings with great texture which looked like they should have been prints – a feeling reinforced by the somber dark browns he tended to favour. I wouldn’t have bought them. Winifred’s paintings were, however, a delight because of her appreciation of colour nuances. Unfortunately her drawing skills were weak. For example, the stiffness of the flower stems which were like sticks and she lost control of tonal values when she came to paint people. Neverthelss I felt her paintings out-shone her husband’s and would have spent my hard-earned cash on some of them. There were a few Alfred Wallis paintings scattered like jewels amongst this mediocrity. I have a soft spot for his ships, not in bottles but painted in profile on rough-edged cardboard. Now for my complaint about the yellow lighting. If you shine a yellow light on a painting it’s like slapping a heavy yellow glaze across it. The yellow light distorts the colours so you can’t see the blues because they’ve turned turquoise and all the reds go orange and the skin tones go sallow and the whites go yellow. Because the whites are now yellow you've lost the tonal variation within the painting. And this happens to every single painting in the exhibition. Paintings should be viewed in the light in which they are painted if the viewer is to be able to see what the artist intended. The Nicholsons painted outside or near natural light-sources like a window. The lighting in the exhibition should therefore be as near to natural light as possible. Now I know that the quality of daylight changes over the course of a day from blueish in the morning to a mellow gold in the late evening and is different in different parts of the country, but an average can be and should be used for displaying paintings painted in daylight. This can be achieved by a combination of white daylight bulbs (which are actually blueish) and yellow light bulbs. The National gallery does this. I can’t remember the proportion of white to yellow bulbs that they use but it’s either two white bulbs to every yellow or the other way around. Apparently the exhibition was curated by the Nicholson’s grandson, Jovan Nicholson. The lighting rig was probably already there, but really he should have noticed the awful yellow light. A curator who doesn’t notice colour doesn’t deserve the job in my opinion.